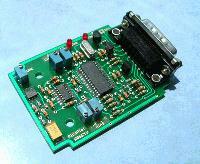 The PicoPlot DF is a signal-strength DF for use with directional antennas. It drives the ( free ) WinPlot IBM display program. ( below ) PicoPlot accepts an analog RSSI signal and sends RS232 messages to WinPlot, for display. The user must provide a reciever with an analog RSSI output, a display computer, and a directional antenna. An audio "squealtone" output allows ( limited ) operation without a display computer. PicoPlot can be used with handheld or ( rotating ) mast-mounted directional antennas. When used with WinPlot, the antenna is rotated through 360 degrees while PicoPlot reports RSSI readings to WinPlot. When finished, WinPlot analyzes the data to generate the polar plot display. Multiple ( successive ) sweeps will update the display, automatically. For portable / handheld use, the antenna should be manually rotated at a constant speed throughout the 360 turn. ( "SteadyScan" mode ) An enable input signals the start/end of the sweep. For greater bearing precision, ( with mast-mounted antennas ) a tach input can be driven from a clock signal that follows the antenna rotation rate, ( "TachScan" mode ) and a heading input detects when the antenna position = 12 o'clock on the WinPlot display. A trimpot calibration procedure must be performed ( once ) to compensate for RSSI DC bias and gain, which will vary depending on the type of reciever employed. A built-in "test pattern" can prove the RS232 link is working properly. The ( free ) WinPlot display program generates a polar-plot display of signal strength versus signal direction, using RS232 data from the PicoPlot DF. ( see above ) WinPlot has a test mode that allows "simulated" operation without a PicoPlot DF, for evaluation / learning purposes... you can download it and run it now. WinPlot accumulates RSSI data while a directional antenna is swept through a 360 degree turn. Once the sweep is completed, WinPlot analyzes the data to generate the polar plot display. Data is automatically re-scaled to fill the screen, regardless of the max / min values of RSSI, and regardless of how fast / slow the antenna is rotated. 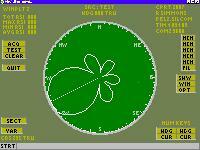 The start / end of each 360 sweep is plotted at the 12 o'clock position of the display. Successive 360 sweeps ( if performed ) will automatically update the display. A "smoothing" function ( SECTOR ) allows readings to be "averaged" across several adjacent bearings, to deal with noise, or deliberate transmitter evasion tactics. ( power fluctuations ) A cursor line is automatically positioned at the "most probable" DF bearing. The GTMR UAV / airborne ELINT scanning DF is a product of GTMR Inc. Leonartown MD, near Washington DC. This DF is the result of a collaboration between GTMR and Doppler DF Instruments, employing a modified / enhanced version of the PicoPlot DF and the WinPlot display program, shown ( above ) on this webpage. The ELINT DF employs a stepper motor / rotary RF joint, to allow constant antenna rotation at 180 RPM, ( 3 scans per second ) similar to a nautical radar antenna. The modified WinPlot display program constantly updates in realtime, generating 3 polar plot displays per second. 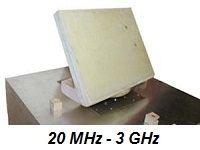 A variety of DF antennas are available, to effectively cover all major portions of the spectrum. 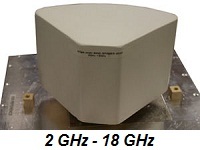 Designed for installation inside a customer radome, total weight is only 8 pounds. Lab tests ( during development ) yielded impressive results, equalling or exceeding performance of other airborne ELINT DF systems that GTMR supports and maintains for the government.... and with a considerable reduction of system weight and cost. Questions / inquiries can be directed to GTMR and/or Doppler DF Instruments ( a.k.a. Bob Simmons ) using the links below the image in the right column.